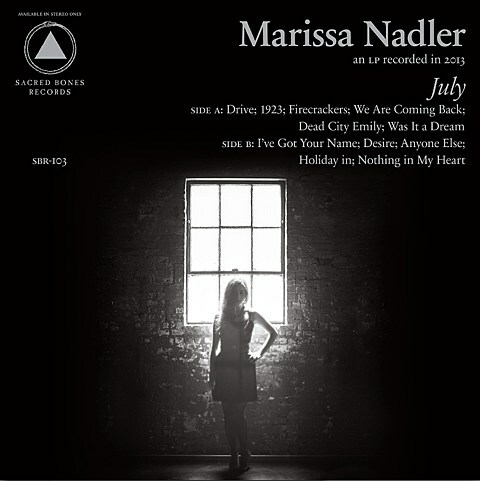 As discussed, psych-folk singer Marissa Nadler is set to release her sixth album, July, on February 4 via Sacred Bones (her first for the label). Not that Marissa hasn’t always been great at creating dark music, but it’s hard not to feel like the darkness is heightened by it being released by the gothy Sacred Bones label (her name looks great in SB’s consistent album cover format, pictured above) and produced by Sunn O)))/Wolves in the Throne Room producer Randall Dunn. Whether or not these factors actually play into the music, this is one of Marissa’s best albums yet and one to look forward to. We already got a taste of it from her previously released single, “Dead City Emily,” and she’s now unleashed another one, “Was It A Dream,” with vocal harmonies that are truly, err, dreamlike. You can stream the new single below. Marissa has also expanded her previously announced tour to include more dates through mid-March. None of the newly added shows are in NYC, but as discussed, she plays here on February 8 at Glasslands with Zachary Cale and her Sacred Bones labelmate Amen Dunes. Tickets for that show are still available.